The mirror cabinet is part of the Kali bathroom collection that Doshi Levien has designed for Authentics. The robust body made from ASA plastic is firmly screwed onto the wall at four points. The Kali mirror cabinet is closed with a door that consists of shatter-proof glass on the front and rear. The high-gloss handle snaps into the body. Five glass shelves of differing length are included. Depending on the room layout, up to four glass shelves can be inserted and locked into the left or right of the body. Depending on the layout of the shelves, they protrude at differing lengths from the cabinet, letting the exterior parts be used as storage surfaces. 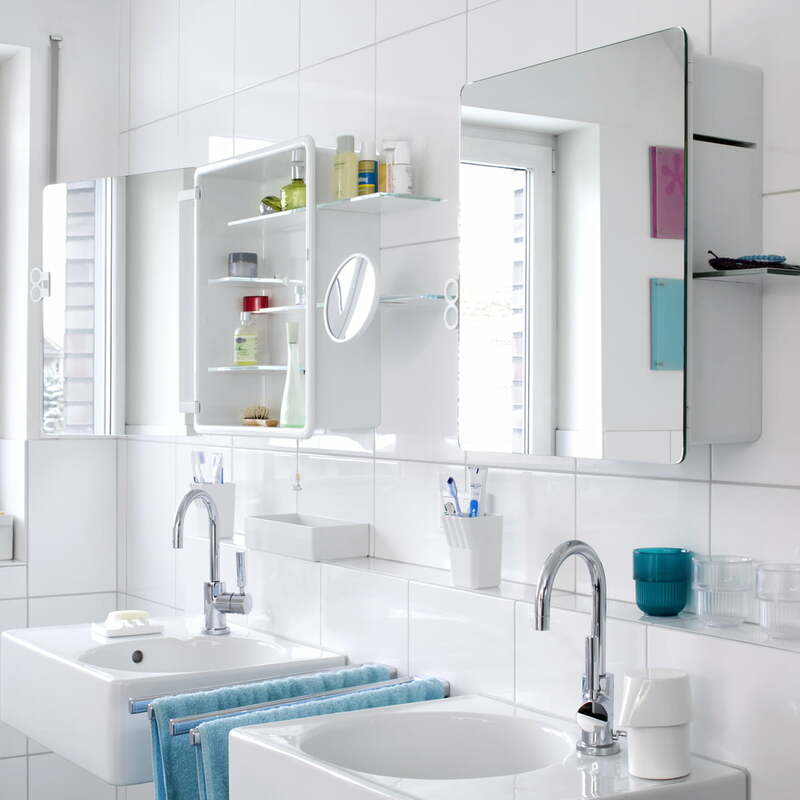 If you want to mount the mirror cabinet in the corner of a bathroom, or if your bathroom has sloping ceilings, you can arrange the shelves so that they do not protrude from the cabinet. 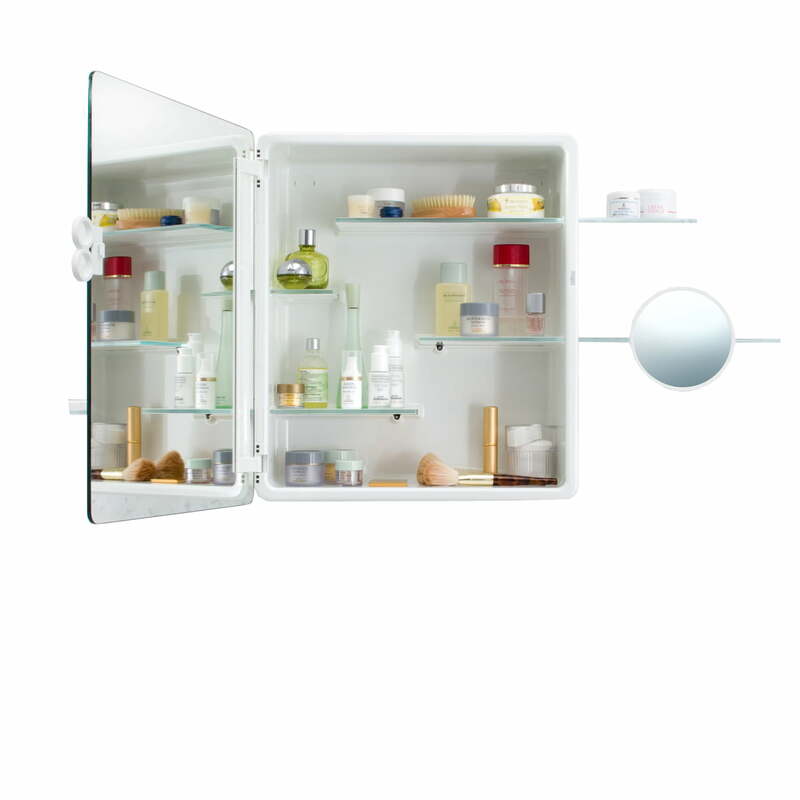 The door of the mirror cabinet consists of double-sided mirror glass and a grip of white, high-gloss ASA plastic. 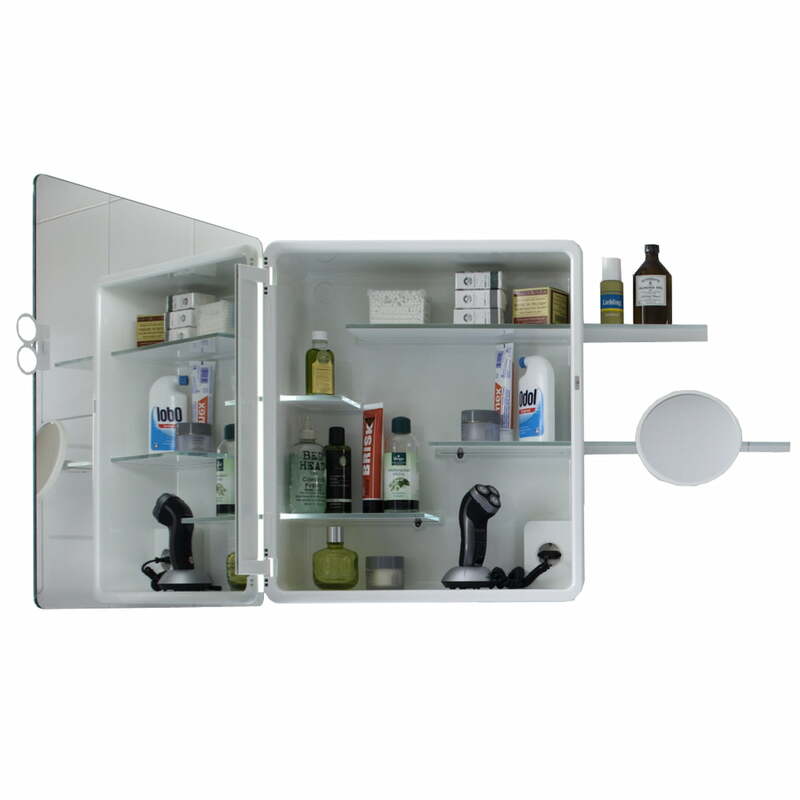 If the door has to be opened to another side, the mirror cabinet can be rotated by 180° before mounting. Authentics delivers the mirror cabinet with wall attachment materials. 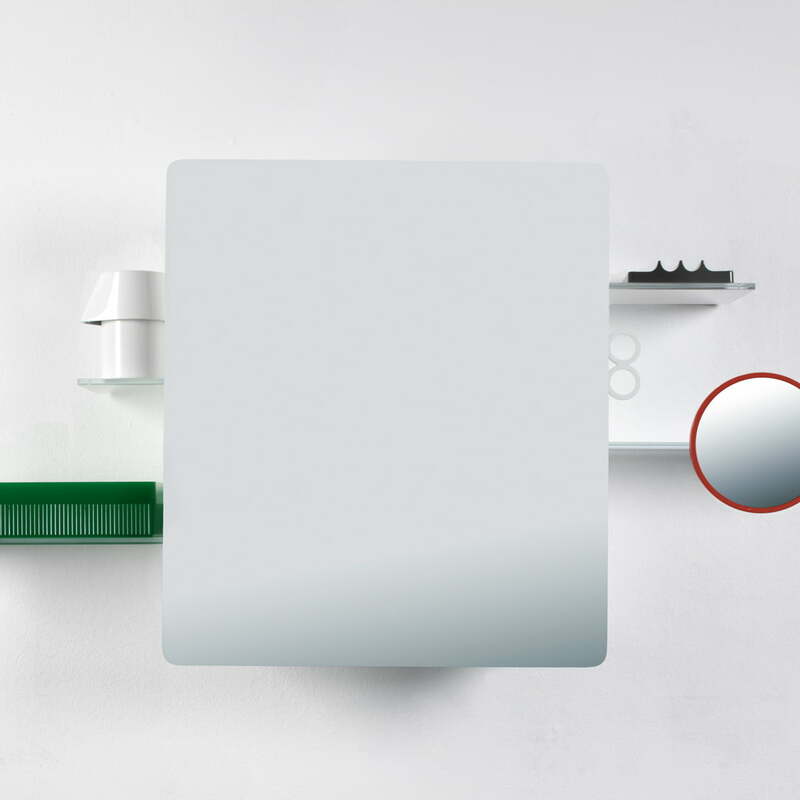 An electrical socket, which can be ordered as part of the Kali collection, can be installed in any corner of the mirror cabinet. Individual product image of the Kali mirror cabinet by Authentics in white. 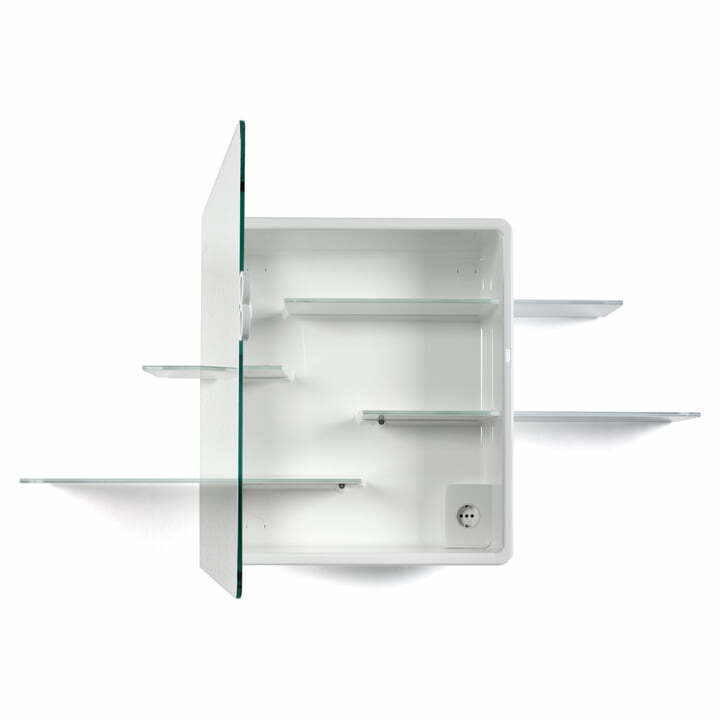 The glass ledges extend over the edges of the cabinet and offer open storage surfaces in the bathroom. The mirror cabinet belongs to the Kali bathroom collection by Authentics. It was designed by Doshi Levien. 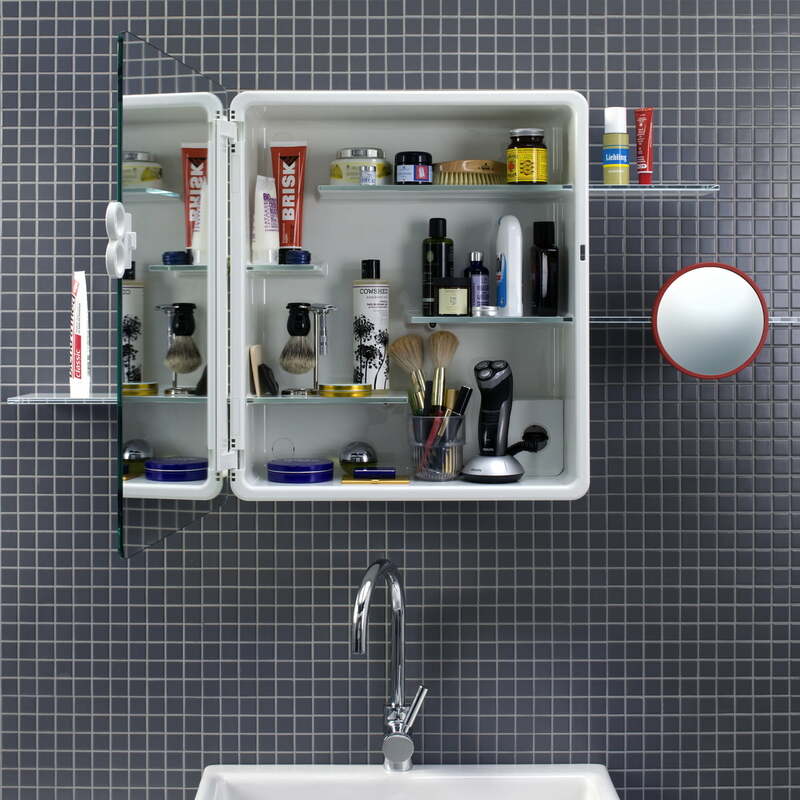 The mirror cabinet offers space on the inside and outside for toiletries as well as accessories. The robust body of the Kali mirror cabinet is made from ASA plastic and is firmly screwed onto the wall at four points. If the door has to be opened to another side, the mirror cabinet can be rotated by 180° before mounting. The Kali mirror cabinet from the Kali collection by Authentics offers a lot of storage space and can be individually arranged to your needs. The Kali electrical socket can be installed in any corner of the cabinet. The Kali mirror cabinet matches any bathroom interior and offers clever spaces in the closed cabinet or on the open shelves. The large front mirror continues onto the back of the door.